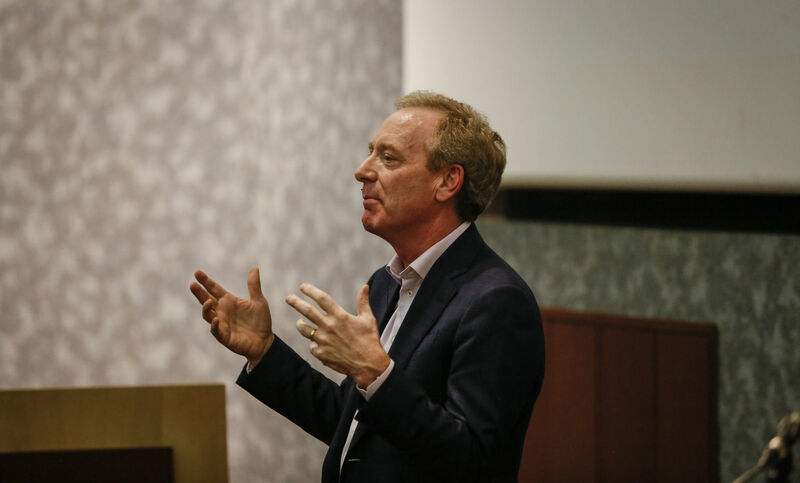 The visit of Microsoft president Brad Smith to El Paso – and the company’s interest in the city – have generated a flurry of ideas about where the tech giant’s investment could lead. Smith was in town last week to speak about artificial intelligence at the University of Texas at El Paso as part of the university’s Centennial Series Lecture series, but he also spoke about his company’s interest in the city. El Paso is one of six U.S. communities chosen for the TechSpark program, as well as Microsoft’s new Technology, Education and Literacy in Schools program, known as TEALS. Smith said three high schools in El Paso will be selected to develop computer science programs by next fall. The hope is to increase that to 10 schools by 2019. Those prospects have civic and business leaders in El Paso thinking big about what Microsoft’s interest will foster. But they’ll have to compile their ideas and shape them into a lasting project. El Paso County Ruben Vogt listened to Smith’s talk last Monday and said he is excited to pitch his own ideas. Vogt said there is some interest in channeling Microsoft’s investment towards the Fabens airport as the county works to create a technology hub there. The county partnered with UTEP in 2016 to develop the Technology Research Innovation Acceleration Park in Fabens. Last September, the U.S. Department of Commerce awarded UTEP a $500,000 grant to create and expand cluster-focused and commercialization programs at the airport. Microsoft hired El Paso native and Franklin High School graduate J.J. Childress as a community engagement manager for the TechSpark program. He’s only been on the job for three weeks, but in time he will be a mediator in discussions and plans to build a signature project. Article Credit: EL Paso Inc.